The Mohammed bin Rashid Space Centre (MBRSC) is a Dubai Government entity which aims to promote scientific innovation and technology advancement in Dubai and the UAE—the Centre works on research projects and studies related to space science, in line with the approach of the United Arab Emirates, in its quest to develop the sector and build national academic skills through it and the centre has now submitted a request to the International Astronautical Federation (IAF) to host the 71st session of the International Astronautical Congress (IAC), which will be held in 2020, in coordination with the UAE Space Agency. H.E Yosouf Hamad Al Shaibani, Director General of MBRSC, made the announcement during the opening session of the Global Space Congress organized by the UAE Space Agency, which ran from January 31 to February 1, 2017, under the patronage of His Highness Sheikh Mohammed bin Rashid Al Maktoum, Vice President, Prime Minister of the UAE and Ruler of Dubai. Al Shaibani confirmed that the IAF will announce the country hosting the conference in 2020 during the coming edition taking place in Australia next September. If MBRSC were to win, the UAE would become the first Arab and Muslim country to host the conference. He also confirmed that MBRSC seeks to enhance communications with the global space community, organize and host international events aimed at sharing experiences and promoting cooperation, which will contribute to driving the sector to more advanced and sophisticated levels. 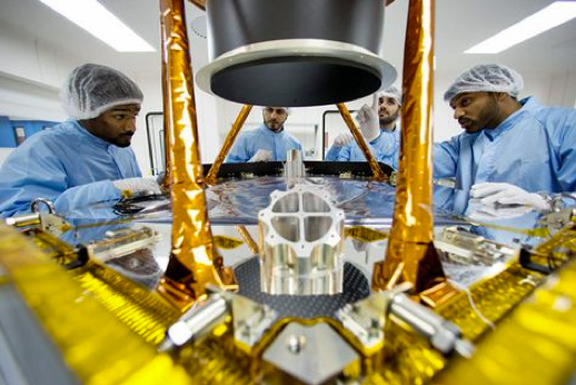 The KhalifaSat satellite during its build. In his speech, Al Shaibani drew attention to the pillars upon which the UAE space sector is built, saying, these pillars enable the space sector to become a driving force for economic growth and sustainable social development in the UAE. It is a journey with an already outstanding record of achievements through which a strong infrastructure was established, capacities were developed, three remote sensing satellite projects were launched, and the launch of the first Arab and Islamic project to explore Mars - Hope mission. The Hope probe will send and data on the Martian atmosphere and will also carry a message of hope to young Arab generations and will open the doors to a new era of scientific and technological invention and discovery. In this regard, Salem Al Marri, Assistant Director General for Scientific and Technical Affairs at MBRSC, was elected last September as a member of the International Academy of Astronautics, at a ceremony held during the International Astronautical Congress in Guadalajara, Mexico. Al Marri has been chosen for his contribution to science, technology and the space sector in the UAE, as well as his excellence in projects aimed at promoting international cooperation in the development of the space sector. Through his membership, Al Marri contributes to activating international efforts and promoting cooperation among all countries and entities to advance and develop space science and technology worldwide. Meanwhile, MBRSC showcased its space projects and initiatives at the Global Space Congress, while the center’s engineers participated in a series of sessions. Eng. Amer Al Sayegh, the MBRSC Senior Director of Space Engineering department and KhalifaSat Project Manager, explained in a session entitled "UAE Visions of New Technology Applications,” the MBRSC strategy on building an integrated system for the space industry in the UAE. He stated during the session that UAE engineers have achieved great developments in the national space sector, from 2006 until they came to build the first Arab satellite on UAE soil with only Emirati expertise, as well as leading the first mission of its kind to explore space, with the Hope mission. The MBRSC satellites has developed significantly after the center launched the first satellite project in the UAE. The MBRSC team invented new technology specifically for KhalifaSat, and there are other space applications, developed by the Application and Analysis Department within the centre, which will be used in studies and research aimed to improve the accuracy of satellite images.